Miriam Rudolph was born and raised in Paraguay, South America. In 2003 she moved to Winnipeg to study Fine Arts at the University of Manitoba where she graduated with a Bachelor of Fine Arts Honours in 2007 and a Bachelor of Education in 2010. She recently completed the Master of Fine Arts in Printmaking at the University of Alberta, Edmonton (2017). She was awarded the University of Alberta Graduate Recruitment Scholarship in 2014 and the Joseph-Armand Bombardier Graduate Scholarship (SSHRC) along with the Walter H. Johns Graduate Fellowship, as well as the Alberta Foundation for the Arts Scholarship for Art and Design in 2015. She has shown her work nationally and internationally. Recently, she co-won the first prize (Best in Show) at the 5th Biennial International Footprint International Exhibition at the Center for Contemporary Printmaking in Norwalk, Connecticut. She has shown her work in Asunción-Paraguay, in Xian - China, at Global Print 2013 in Portugal, at the International Print Center New York, at the Highpoint Center for Printmaking - Minneapolis, in Washington D.C., at Martha Street Studio - Winnipeg, Toronto, and Ottawa. 2017 disPOSSESSION, Martha Street Studio, Winnipeg, MB. disPOSSESSION, A/P Gallery, Calgary, AB. disPOSSESSION, MFA Thesis Exhibition, FAB Gallery, University of Alberta, Edmonton, AB. 2013 The Art of Healing Program Exhibition, Abbott Northwestern Hospital, Minneapolis, MN. 2013 Narratives of Home and Farewell, Small Works Series - McNally Robinson, Winnipeg, MB. Encuentros y Despedidas, Espacio Miguel Acevedo - Manzana de la Rivera, Asunción, Paraguay. 2012 Narratives of Winnipeg and other works, Fleet Galleries, Winnipeg, MB. Narratives of Home & Farewell, Threshold Gallery/Highpoint Center for Printmaking, Minneapolis, MN. 2011 Mapping Home, Pembina Hills Art Center, Morden, MB. Mapping Home, Martha Street Studio, Winnipeg, MB, (juried). Mapping Memories, Small Works Series — MacNally Robinson, Winnipeg, MB. 2007 Experiencing Places, Outworks Gallery, Winnipeg, MB. 2006 Visual Diaries, GoSA, Winnipeg, MB (juried). 2017 Splitgraphic 8, Split University Gallery - Vasko Lipovac, Split, Croatia, (curator: Ingrid Ledent). Global Matrix IV, Purdue University Galleries, West Lafayette, IN, (juried). 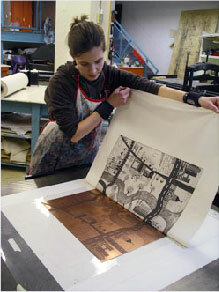 5th Biennial Footprint International Exhibition, Center for Contemporary Printmaking, Norwalk, CT,(juror: Andrew Raftery). The Heart of America, Art in Embassies at the United States Department of State, Tbilisi, Republic of Georgia (curator: Claire D'Alba). Tandem - Going Places Together, MHC Gallery, Winnipeg, MB, (juried: two person show). 2015 Formation, Guanlan Print Museum, Guanlan, China, (juried). 2014 7th International Printmaking Biennial of Douro, Alijó, Portugal, (curator: Nuno Canelas). 4th Biennial Footprint International Exhibition, Center for Contemporary Printmaking, Norwalk, CT, (juror: Elisabeth Hodermansky). 2013 Global Print 2013, Douro Museum, Alijó, Portugal, (Invitation by Nuno Canelas, Curator). 23 Parkside National Small Print Exhibition, Parkside Gallery, Kenosha, WI, (juror: John Hitchcock). From Paraguay to Winnipeg - Explorations of Place, Home, & Childhood, MHC Gallery, Winnipeg, MB, (Two-Person). 2012 Mid America Print Council Juried Exhibition, Arts Council of Southeast Missouri, Cape Girardeau, MO, (juror: Liz Zanis). New Prints 2012/Summer, International Print Center New York, NY, (juror: Shahzia Sikander). 2011 Twenty: the 20th Cooperative Exhibition, Highpoint Center for Printmaking, Minneapolis, MN. Prairie Narratives, Lafreniére & Pai Gallery in Collaboration with Prairie Scene, Ottawa, ON. Here and There, Propeller Center for the Visual Arts, Toronto, ON, (curated exhibition). Canadian Impressions, Inter American Development Bank Cultural Center, Washington, D.C., (juried). 2008 All of the Above, a member's show, Martha Street Studio, Winnipeg, MB. Thesis Works Exhibition, Gallery One One One, Winnipeg, MB, (curated by Robert Epp and Cliff Eyland). Gonzalez de Armas, Liuba. "FAB Gallery: Abstracting Place in Miriam Rudolph's disPOSSESSION.' The Gateway. March 14, 2017. Jans, TJ. "Miriam Rudolph: disPOSSESSION. 'Curious Arts. University of Alberta. February 28, 2017.